I read this article and found it very interesting, thought it might be something for you. 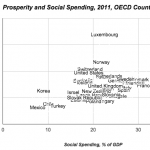 The article is called Why Welfare and Redistribution Saves Capitalism from Itself and is located at https://evonomics.com/whats-the-secret-to-joining-the-rich-country-club/. There’s a curious fact about the wealth and growth of nations that you rarely see mentioned: No country has ever joined the modern, high-productivity, rich-country club without massive doses of redistribution, and universal government programs for social support and financial security. Not one. Ever. There are a zillion other measures you could plot, but they paint roughly the same picture. 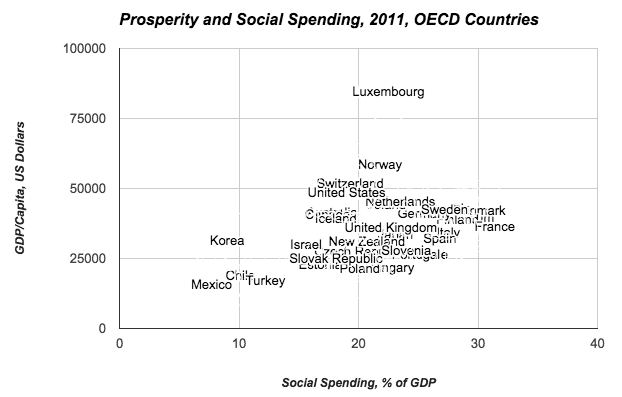 In this measure, the richest countries all devote fifteen to thirty percent of GDP to social spending. As Bruce Bartlett pointed out recently, Germany — a darned “conservative” country that is thriving today, and which rode out our recent economic Great Whatever better than almost any other country — started building its welfare state more than 150 years ago. If countries like that were in fact so economically efficient, shouldn’t we expect to have seen at least one of them emerge, and surge ahead of all the rest — outcompeting all the others, in a very Darwinian sense? Isn’t that the prediction that libertarians and conservatives are making? How can we explain the complete and abject failure of those predictions? An explanation is perhaps not far to find. Market capitalism — especially modern “holding-company capitalism,” in which corporations own corporations which own corporations, ad infinitum — inevitably concentrates wealth and income into fewer and fewer hands. It’s just the nature of the beast. Along with its immense, world-changing, manifest benefits, market capitalism labors under that inescapable burden. Then add an Econ 101 notion that is pretty much universally accepted, because it’s strongly supported by theory, empirics, and just plain sensible intuition: decreasing marginal propensity to spend. A poorer person is more likely to spend an extra dollar (in wealth or income) than a richer person. Because: the “utility” (or just benefit) purchased by that extra dollar is so much higher for the poorer person. The fourth ice cream cone, iPhone, or Lamborghini just isn’t as enjoyable as the first. So greater concentration into a few hands means less spending — in economic terms, lower “velocity,” or turnover, of wealth. Absent the redistribution and government programs that rich countries provide, market capitalism strangles itself, through concentration, with insufficient demand to drive — to “incentivize” — its own masterful engine of production. Absent those programs, countries never make it into the the rich-country club. Nobody would claim that those programs are sufficient to make a modern country rich. That would be silly. But based on the bare facts over the last century or two, it seems safe to say that they are necessary. Or to put it another way, and bring it right home to America: The New Deal saved capitalism from itself. Marx was very wrong on the politics of things, but he was very right about capitalism’s fatal flaw. But: he was also wrong about the “fatal” part. FDR proved him wrong. The New Deal showed that capitalist countries could overcome the “concentration” curse. Using a host of government programs, it resurrected the mighty American market engine from the depths of The Great Depression, and over three or four decades delivered the greatest burst of growth, productivity, and prosperity that this country — and this world — has ever seen. How did that happen? The New Deal shared the wealth in manifold and diverse manners, using a plethora of government programs, rules, and institutions. Competition is widely fetishized as a cure for all ills, but its adherents fail to realize its fundamental (and undeniable) virtue: it creates incentives for groups to cooperate. Only a tiny handful of species, out of millions that have evolved over 4.5 billion years, have developed eusociality and widespread, large-group altruism. It’s really hard (unlikely) for it to evolve, because in-group selection among competitors — undercutting the group for individual benefit — is such a powerful, dominant, contrary evolutionary force. Eusociality exists among a number of insect species, some crustaceans, and just a few mammal species — mole-rats, and notably, humans. And humans have turned that dial to eleven (see Ultrasociality). Maybe because of our capacity for language, humans have developed as the globe-dominating eusocial species, sharing on a scale of millions and billions of individuals. The 21% of GDP that the average rich country shares via social spending is only one roughly measured expression of that reality. Some wise souls will certainly point to another universal human activity — trade — as the greater driver of human success. I, for one, would not contest that. But hey: people trade in (and with) every country. Very few of those countries have joined the club. As labor productivity spirals ever-upward — producing ever-more goods with less and less human labor — and as an ever-greater slice goes to owners 0f things versus doers of things, it gets harder for humans to lay claim to those goods merely through the sweat of their brows and the content of their character. Absent those widespread or universal claims to a decent slice of the pie — and the widespread iPhone-buying power that results — the machinery of market capitalism loses its necessary fuel, sputters, and grinds ever slower (than it could or would otherwise). Happily, we know the solution to that problem. It’s the same solution that has delivered unto us the bounty and prosperity that rich countries enjoy today. To put it simply: Yes. Prosperity requires a welfare state. Or to put it another way: Widespread prosperity both causes and is greater prosperity. Note from the author: I need to reply proleptically to the inevitable objections that always come up: Singapore and Hong Kong — city-states with populations of the Detroit and Philadelphia metro areas, respectively. Circa ninety percent of Singapore residents live in government-built housing. Employees and employers make compulsory contributions to a government-run comprehensive savings plan (“Provident Funds”) — 34.5% of earnings for most prime-age workers — to fund their retirement, healthcare, and housing. 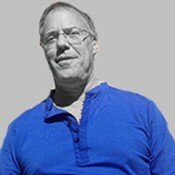 The health care system is based on a nationalized health insurance plan, and includes both subsidies and price controls. Hong Kong is a protected trading area operating under the authority of external nations — Britain, then China. Like Singapore, it has its Mandatory Provident Fund, other social support programs, and free public health care. Update: Just out from this author, check out the latest figures on growth and prosperity in big-government Europe versus small-government U.S.
Economic Theory Is Dead. Here's What Will Replace It. This entry was posted in Economics and tagged Welfare. Bookmark the permalink.